Premium: The Traditional Maroon template is an analogue of the traditional blue template, with the primary color being maroon in the document. This template also performs extremely well with all Applicant Tracking Systems and is a Hiration Best Seller! Structure: A single column template, this has solid maroon lines as separators for different sections and is able to carry a lot of text. This resume template will present your resume as a highly professional document in front of the recruiters. Senior professionals from traditional industries like Sales, Marketing and Operations can use this template to really bring out their achievements. 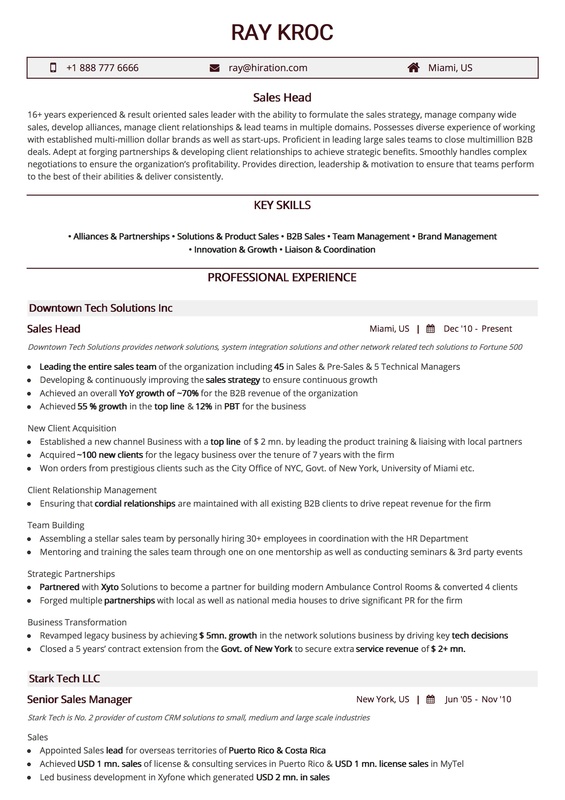 Design: This resume template primarily uses maroon and it's lighter shades to provide a highly professional resume. A darker shade of gray has been used for the descriptive text of the document. Typography: The typography has been set to include ample white space in the resume to make it clearly readable by any recruiter. The headings specifically become the highlight of this resume and help you to convey specific messages to the recruiters. The font of choice is Open Sans.